Old school football game. It uses X's and O's in raster graphics. In head to head play each player controls one of their players. 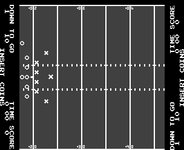 A roller ball is utilized to move the player up and down the field. Tackling is accomplished by running one of your players into one of theirs. Your team consists of many AI controlled players as well that block and pursue as best as X's and O's can.